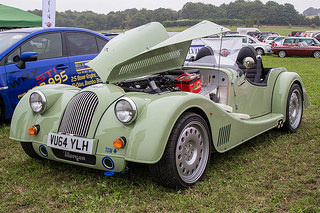 A total of 3,506 of the Morgan Plus 8 sports car had been built by 1986, and their popularity continued to grow both in the US and UK. In 1983, Plus 8's fitted with fuel ignition, which was then offered as an option, now developed 190 bhp at 5250 rpm. In 1984, there were two versions of the Plus 8. The standard production model was fitted with two Stromberg carburettors, whilst an optional variant, fitted with a Bosch L-Jetronic fuel injection system, was designated the Plus 8 PI. However, demand ultimately favoured the latter variant, and so it was that this model became the standard production version. That same year, the cam gear steering system was replaced by rack and pinion. In 1987, all Plus 8's were fitted with fuel injection. In 1990, the original Rover 3.5 litre, V8 engine was replaced by the 3.9 litre unit as used in the Range Rover Vogue SE saloon. This used the Lucas 14CUX fuel injection system, and developed 190 bhp at 4750 rpm, and 235 ft/lbs of torque at 2600 rpm. In 1991, the lever arm units used at the rear were changed in favour of Gabriel telescopic dampers. In 1993, wire wheels were offered as an optional extra, and servo assisted brakes were introduced. Since one of the criticisms of the Plus 4 concerned the difficulty, by some customers, in entering and leaving the car, it was decided to address this problem by the introduction of the Long Door variant. 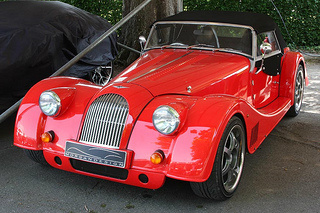 Apart from providing more interior space to alight, different headlights were used, and the windscreen was lowered. In 1995, the existing five speed LT77, all synchromesh gearbox, was replaced by Rover's improved R380, five speed all synchromesh unit. In 1997, the Rover 4.6 litre, V8 engine, still using the 1CUX system, was offered as an option, and developed 220 bhp at 5000 rpm, and 260 ft/lbs of torque at 3600 rpm. Around 300 of this variant were finally built. The production model now included air bags, longer doors, and a redesigned facia. In 2000, all Plus 8's were fitted with the GEMS fuel injection system, as used in the Land Rover Discovery saloon. In 2002, a limited edition of 40 units of the Plus 8 were built to commemorate the Plus 4's Class win in the 1962 Le Mans 24 hour race. In 2003, to commemorate the 35th Anniversary of the Plus 8, a limited edition model of around 200 units was introduced, which featured a standard engine with stainless steel over riders and wire wheels, a mesh grille, and a walnut dashboard. In 2004, the Rover V8 engine was no longer able to meet the strict US emission regulations with the result that, since US exports were its major market, production of Plus 8's had to end. Up to 2004, a total of over 6000 units had been built. With the Plus 8's luxurious interior now trimmed in leather and wood, its market segment was slowly shifting away from that of being a pure performance sports car. One motoring journal described the Plus 8 as totally outdated, but strangely enjoyable to drive. 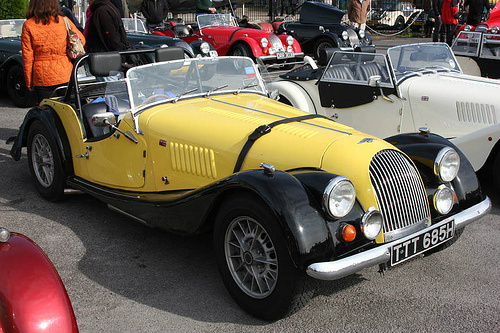 With a production life of 36 years, the Plus 8 was Morgan's best selling sports car.